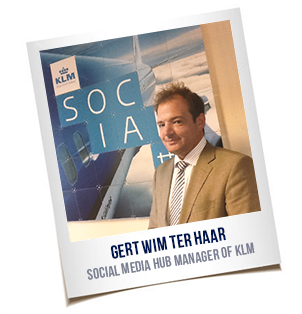 Gert Wim ter Haar, Social Media Hub Manager of KLM, the most Socially Devoted brand on Facebook, is part of a team of 100 social media employees, managing KLM’s 24/7 customer care service in nine different languages the world over. Socialbakers CEO Jan Rezab, interviews him to find out how the Dutch airline achieves such great results. Inside your corporate structure, is customer care placed under digital marketing or in a separate customer care division? It is under digital marketing, where I also work. The team is in very close cooperation with our communications department. The people we have in our organization are recruited from a variety of backgrounds. For example, we are recruiting more of our cabin crew––people who really know our passengers, who have experienced the situations on board, and who have been close to them. This demonstrates the kind of empathy you are looking for from a social media service. If you look at the profile of an old-fashioned call-center employee, compared to a social media employee, there are definitely differences between the profiles. Knowledge of the company needs to be extremely broad, because we work as a one-stop shop and try not to send passengers to different channels to resolve issues. I also find it very important for people working in social media to have very good writing and communication skills. When did KLM start with social media? In April 2010, when the Icelandic ash cloud incident happened. After a volcano created a huge ash cloud above Europe, plane travel was impossible for about five days. Our phone-lines, email, desks at the airport––everything was jam-packed, and everyone had issues that needed to be resolved. At that time, we were already using social media on a small-scale, experimenting with Twitter and Facebook. People started posting questions on these pages because they were desperate to get in contact with the airline. So, we decided to start a volunteer organization with the non-operational staff of our company, here at the head office, at around 100 people. We worked for four days and four nights, as hard as possible, to answer all the questions. The press picked up what we did. Of course, it was very bad that we couldn't fly for a couple of days, but for social media, it was our kick-off. In 2010, we institutionalized social media customer care within our company, first with office hours, in English and Dutch. In mid-2011, we were 24/7, and in 2012 we expanded the languages. Through out 2013, we are working on the quality of responses to be better and faster, as well as focusing on alternative platforms besides Facebook and Twitter. What other platforms are you focusing on? We have already started a 24/7 service on VKontakte, the Russian platform, and it exceeded our expectations. With our 24/7 presence over there, I am very sure that we can push this even further in coming months. We are also working closely together with Google to see whether Google+ is a platform, which we could use for social service, hopefully later this year. And we have some more prospects we are looking into, including the Chinese market, where we are trying to see how we can ramp up our social media service. We’re always working on improving our response times. Our promise to our customers, which we say after each and every flight and which we are very proud of, is that you can contact KLM 24/7 on Facebook and Twitter. Also, we claim that we can respond within the hour. However, we are currently investigating the possibilities of further reducing this response time. As social media becomes more mature, the expectation of our customers is increasing as well. Because many of our customers know that we provide this kind of service, many of them would like it to be even faster. Have you used any CRM tools to manage your social customer care? Yes, we do. As soon as a customer contacts KLM through Facebook or Twitter or any other platform, we create a personal account in our CRM system, where we attach all of the conversations, previous conversations, flight numbers, future trips, etc. We build up these profiles for our customers in our social SRM because, when we enrich these profiles with as much data as we can, we are working towards a more effective conversation with our customers. I think that the ROI question always comes up. I don't like asking it, I think that if you have a one-on-one conversation with someone and its positive, there is ROI. However, what is your opinion on this? I think the number one thing with ROI is a happy customer, and happy customers bring a lot of value to your brand. The ripple effect of social media is that if you have customers who are happy, people see that, and it has a direct impact on how people perceive your brand. It is very hard to put a tangible value on happy customers, but it is a change we see more and more and we try to monitor this. We measure the sentiment at the start and end of each conversation. And we are seeing more and more conversations where we are able to change the customer’s sentiment over the course of the social media conversation. I see this as ROI, because happy customers want to buy tickets again; they want to travel with us again. And how do you determine sentiment? At this point, we have our agents trained to manually review the sentiment at the start and the end of the conversation. We are looking into opportunities to make this an automated process, but it’s a tough job to have each and every conversation measured. As the number one brand, what advice would you give to other companies? What I would say is that a good approach is to start with listening. Listen carefully to what your customers are saying, and then, based on what you're hearing using the listening tools, make a very clear strategy on how you want to respond and on which platforms. Set very clear goals within your organization. Don't do social service just because everybody is doing it. When you respond on social media, you must do it with a clear strategy and a clear vision. Finally, make sure that you have the tools in place, and that you have empathetic staff that really knows your products and has the ability and eagerness to serve the customers as well as possible on social media.